KIEV, Ukraine -- Yulia Tymoshenko is demanding that the ruling government respond to the actions of their ‘colleagues’ who organized a provocative exhibition in the Ukrainian House in Kyiv. "I want to hear a response from the Party of Regions regarding their ‘colleague’ who dared organize an anti-Ukrainian provocation in the Ukrainian House. Although I understand that my demand makes no sense. 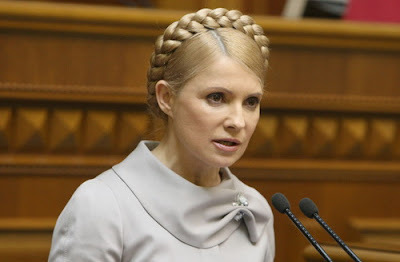 Unfortunately, the new government’s strategy is anti-Ukrainian," Yulia Tymoshenko said regarding the exhibit "Volyn Massacre – Polish and Jewish victims of OUN-UPA" in the Ukrainian House. Yulia Tymoshenko once against stressed that from its first days in power, the new government team is demonstrating that it despises everything Ukrainian. "They’ll take any steps and resort to any provocation in order to distort our history, to get people to argue and divide society into friend and foe. They still can’t accept the existence of an independent Ukrainian state. It’s alien to them," said the leader of the opposition. Yulia Tymoshenko is also convinced that a wise people will never consider the current government to be Ukrainian. "That’s why I believe that today’s government of Yanukovych and the Party of Regions is a deplorable, but short-term misunderstanding in the history of independent Ukraine. I demand the immediate release of the journalists and our deputy’s assistant," she said. Meanwhile, BYuT’s press service has referred to the exhibition in the Ukrainian House as "deliberate provocation and a blatant attempt by its authors and ideologues to distort tragic pages in Ukrainian history and misinform the public." "It’s natural that such desecration of national dignity sparked outrage among the journalists who were present and whose only fault was that they began to ask ‘awkward’ questions. As a result, unknown individuals who called themselves Berkut [a special police unit] but didn’t show any identification, detained the journalists and an assistant to a BYuT MP." BYuT is demanding that the Presidential Administration and Party of Regions put a stop to their mockery and denigration of Ukrainian history and attempts to capitalize on events that claimed hundreds of thousands of lives. "We demand that the organizers of the so-called ‘exhibit’ and participating law enforcement officers be brought to justice."